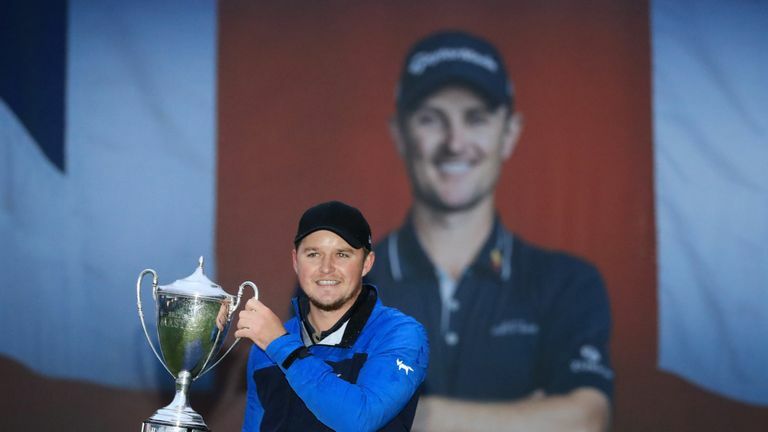 Eddie Pepperell declared himself a proud champion of an "iconic" tournament and looked forward to a probable trip to Augusta National after clinching victory at the Sky Sports British Masters. Pepperell's overnight three-shot lead was reduced to one several times during the final round in miserable conditions at Walton Heath, but he dug deep to grind out a two-shot win over playing-partner Alexander Bjork. The Englishman struggled from tee-to green but managed to salvage a number of clutch pars over the front nine and then holed a 122-yard wedge from the rough at the 10th to vault three clear again, only to set up a nervy finish with back-to-back bogeys at 15 and 16. But he closed with two more battling pars while Bjork bogeyed the last to finish two behind, and Pepperell admitted it was one of the most challenging days of his career after lifting his second title of the season following his win in Qatar in February. "It's so difficult out there, but I guess it was a good thing, not being a birdie-fest," said the 27-year-old, who is projected to break into the world's top-35, with the top 50 at the end of 2018 qualifying for the Masters in April. "It was just a pure grind from the get-go, and I didn't play very well, so it shows how important it is to build a lead I think. It was just a case of hanging in all day, really. I didn't expect the weather to be quite so miserable, but I'm thrilled to be stood here with the trophy, especially with Justin hosting on such a beautiful course. "I wasn't too nervous out there, maybe that's because the conditions were so brutal. It was just a case of just trying to hit it forward. But I felt like my emotions were pretty good and my temperament was pretty solid all week, really." Asked about the prospect of being in the field for more majors and World Golf Championship events next year, Pepperell added: "It's going to be a great opportunity for me to go out there obviously to America and play a few more majors and WGCs obviously. I haven't got my head around that, but I intend to." NFL Draft: Who needs a QB?